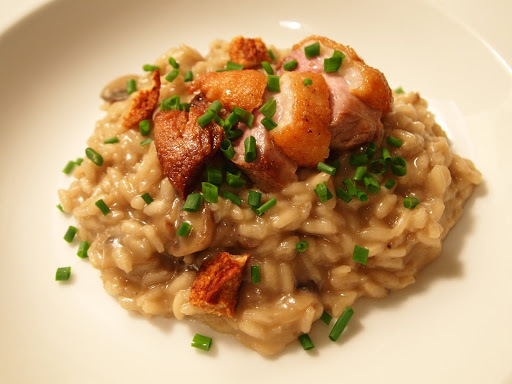 My favorite kind of risotto besides a simple cheese risotto is mushroom risotto. I was craving duck too so I served the two together. For the mushroom stock you can use scraps or button mushrooms. Just combine equal parts (by volume) of mushrooms and water and add a bit of salt. Bring it to a boil and let it simmer until you get the flavor you want. ← Travel Series: San Sebastian, Spain, "Arzak"